| Restaurant Listings | Area Attractions | Local Resources | Your Hosts | Weather | Why is it called "Pie-in-the-Sky"? Long known for Vegetarian, Vegan, and specialized, individualized menu plans, the article below is focused on one of our favorite things to do for vegetarian and non - vegetarian guests. All breakfasts begin with servings of fruit and choices of tea, good local coffee, local cidar, not-so local orange juice, and sometimes other juices. As much as possible we serve our own maple syrup and some veggies raised in our gardens each year. Sausages and bacon come from close neighboring farms where we know the animals are treated humanely. 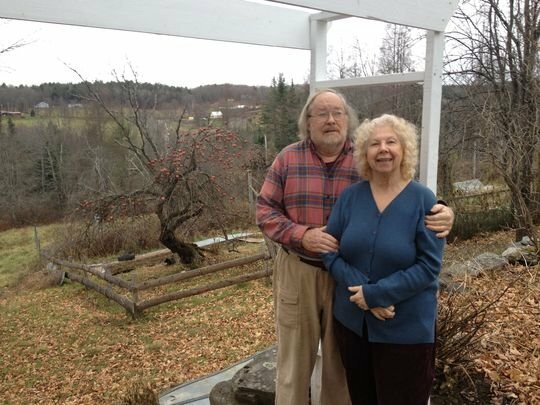 MARSHFIELD Jay Moore and Jude Sargent met one day in 1983 as they picketed the General Electric factory in Burlington to protest the plant's manufacture of Gatling guns for the U.S. military. Sargent was arrested twice. "Yeah, that impressed me," Moore jokes now. He himself was arrested some time later during a sit-in at the Winooski office of U.S. Sen. Robert Stafford. Love blossomed. Marriage ensued. In 1985, the two social justice activists blended their households. Sargent had been living in a commune in Plainfield, Moore in a cabin in Adamant, and purchased a farmhouse in the hills of east central Vermont. This house, too, had been a 1970s commune called Pie in the Sky. The couple's plans for reviving some form of communal living did not come to pass. Instead, over 15 years they fixed up the sprawling home while working at jobs off the farm. "About 18 years ago, we thought the house was good enough to charge people," Moore said. Pie in the Sky Bed and Breakfast was born. Moore and Sargent found a new calling as hosts and topnotch breakfast cooks. I discovered Pie in the Sky and its fabulous breakfasts this fall, when two Massachusetts friends (one of them a former Pie in the Sky communard) spent a night there. We joined them for a morning meal on a closed-in porch looking out over a classic Vermont vista of hill farms. Sargent’s baked organic apples from trees right outside the window followed her homemade scones and hot coffee. And that was just for openers. Moore, the main course chef, laid out a feast of local no-nitrate bacon and braised locally raised shiitake mushrooms. The piece de resistance was a gorgeous, puffy smoked cheddar soufflé with roasted red peppers. This was possibly the best thing I've ever eaten at 10 o'clock in the morning: savory and mouth-filling yet light, with sweet peppers perfectly complementing the smoky cheese. Happily, the soufflé was also intensely local, concocted of Grafton smoked cheddar, local organic raw milk, and eggs from nearby Stilbroke Farm. Local, yes; rustic or amateurish, no. 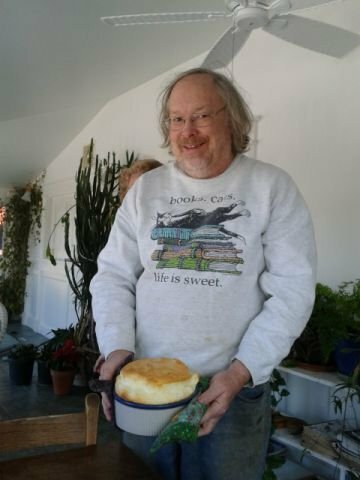 Moore's recipe is based on Julia Child's cheese soufflé from Mastering the Art of French Cooking, and he is an expert. In spring, guests might find wild-foraged fiddleheads or local asparagus in the soufflé; in summer, there could be leeks or other garden vegetables. Jay Moore and Jude Sargent combine their work as social activists with hosting guests at their bed-and-breakfast in Marshfield, a 19th-century farmhouse that once housed Pie in the Sky commune. Too many cooks are soufflé-wary, fearing the concoction will not rise or will collapse before it reaches the table. In fact, soufflés are incredibly easy to make and " if Child's instructions are followed" just about foolproof. In nearly two decades, Moore says, he's only had a soufflé fail once, when he was making two at once and visiting with an old friend at the same time. He describes soufflé as his signature dish. "I must have made a thousand of them by now," he said. "You'd be surprised how many people have never tasted one." I had counted myself as a soufflé-avoider, but now I'm a convert. My re-creation of Moore’s smoked cheddar version was an outstanding success the centerpiece of my recent wedding anniversary dinner. Pie in the Sky gets its name from a song by the old folksinger and labor activist Joe Hill: The chorus ends, " Work and pray, live on hay/You'll get pie in the sky when you die." Or, if you are truly deserving, a smoked cheddar soufflé. 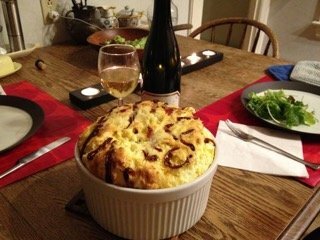 Smoked cheddar soufflé makes an excellent light dinner with salad and a glass of wine. The recipe is bed-and-breakfast owner Jay Moore's adaptation of a classic soufflé from "Mastering the Art of French Cooking," Julia Child's seminal cookbook. (Photo: CANDACE PAGE/For the FREE PRESS) of Candace's dinner souffle. (If you lack confidence, Julia Child provides detailed, illustrated instructions in Mastering the Art of French Cooking" though I think the instructions here will get you through). Measure out all your ingredients. 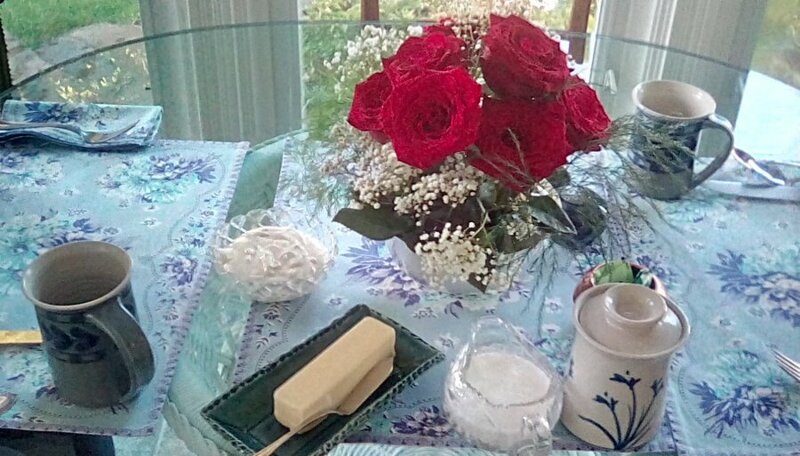 Butter inside of soufflé mold with 1 teaspoon of butter and sprinkle with the Parmesan. Melt the rest of the butter in medium saucepan. Stir in the flour with a wooden spoon and cook over moderate heat until butter and flour foam together for two minutes without browning. Remove from the heat; when mixture has stopped bubbling, pour in all the boiling milk at once. Beat vigorously with a wire whip until blended. Beat in the seasonings. Return over moderately high heat and boil, stirring with the wire whisk for 1 minute. Sauce will be very thick. Remove from the heat. Immediately start to separate the eggs. Drop the egg white into a ceramic or stainless steel bowl, and the yolk into the center of the hot sauce. (You want to be sure no bit of yolk falls into the whites, so the safest method is to collect each white in a small bowl, then transfer to the larger bowl once it is safely separated. The egg-white bowl must be bone-dry with no hint of grease.) Beat in the yolk. Repeat with the remaining three eggs. Correct seasoning. Add an extra egg white to the ones in the bowl and beat with the salt (a wire whisk works, as does an electric beater). As soon as the whites are foamy, beat in the cream of tartar. Beat whites until stiff — a dollop of white scooped out with the whisk should stand up straight. Stir a big spoonful, about a quarter of the egg whites, into the white sauce. Stir in all but a tablespoon of the cheese. Delicately fold in the rest of the egg whites. (To fold, cut straight down through the egg whites and sauce, scrape along the bottom of the pot and then lift. Turn pot and repeat until the whites are mostly incorporated, Don’t worry if there are few clumps of egg white). Turn the mixture into the soufflé dish, which should be about ¾ full. Smooth the surface with the flat of a knife. Lay the strips of red pepper in a decorative pattern. Sprinkle the remaining cheese on top. Set on the middle rack of the oven. Immediately turn heat down to 375 degrees. (Do not open the oven for 20 minutes.) In 25-30 minutes, the soufflé will have puffed about 2 inches over the rim of the mold and the top will be nicely browned. Bake 4-5 minutes more to firm it up. Serve at once.